Analogue Layout. This is not for use with a digital layout since the fitted suppressor can interfere with the digital signal. BOXED GRAHAM FARISH 'N GAUGE' TANK ENGINE - FINE RUNNER. Condition is Used. Dispatched with Royal Mail 2nd Class. This is a Graham Farish boxed DMU as described above. It is in running order and was serviced a while ago by a well-known Farish agent and little used since. It was lightly weathered by a well-known professional. Produced by Hornby in 2008 to mark the 70th Anniversary of the Mallard LNER Class No 4468 pulling a seven coach train reaching 126mph on Stoke Bank and breaking the world speed record for a steam locomotive. Make Supersized seem small. An ideal way to extend your new train set or existing layout. 4mm Flanged pin point Bearings x 40. Alan Gibson. 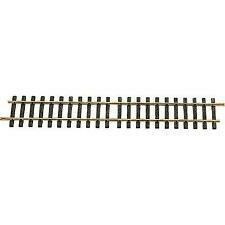 Hornby R8222 Track Extension Pack B Standard Single OO Gauge 1:76 Scale. Condition is New. Dispatched with Royal Mail Signed For® 2nd Class. 4mm Handrail Knobs. Alan Gibson. Slater's 7053 O gauge LMS/BR 20 ton goods brake van kit, unassembled, boxed. Looks complete but no transfers are with it Condition is New as it has never been started. Dispatched with Royal Mail 2nd Class. Bachmann 32-352 Standard Class 4MT Tank 80032 in BR lined black - 00 Gauge. Condition is good - The Locomotive has been kept in a display cabinet well away from direct sunlight and rarely used. Model has been test run without problem. Box is generally good with slight edge and flap wear. The model will be well packed. POST UK ONLY - Payment by PayPal. Hornby R8206 Power Track. Condition is Used. Dispatched with Royal Mail 2nd Class Large Letter. BOXED GRAHAM FARISH 'N GAUGE' LMS TANK ENGINE. Condition is Used. Dispatched with Royal Mail 2nd Class. CRIMSON & CREAM LIVERY. B.R. MK1 RESTAURANT CAR. The box is in very good, but not quite perfect condition. Hornby R.2045 Virgin 3 car Lady in Red" h s t. Condition is Used. Dispatched with Royal Mail 2nd Class. Attic find .down as used. But looks in v good condition. New listingDapol Plastic Model Kits OO HO Gauge C047 "BR Railbus"
Dapol Kitmaster "OO / OH" scale Plastic kit - C047 BR Railbus. BOXED : In sealed plastic bag. 5 out of 5 stars - Dapol Plastic Model Kits OO HO Gauge C047 "BR Railbus"
7 product ratings7 product ratings - Dapol Plastic Model Kits OO HO Gauge C047 "BR Railbus"
British Railways Mk I Brake Gangwayed Coach [BG] To General Utility Van [GUV] 0.012 Etched Brass Sides & Metal Die Cast Ends Conversion Kit By Kingdom Kits. Complete With Instruction Sheet. 'N' Gauge 1:148 Scale. This Is A Very Good GUV Conversion Set. Very Unusual Item, Rarely Seen. It Has Been Safely Stored For Many Years. * I Ship To Any Country World Wide!! * This set of Kingdom Kits BG to GUV conversion items are in excellent condition as they have been in safe storage for quite a few years. When complete and painted the converted coach will look superb on any period layout - Check the photos. *I will send this model within the UK via Royal Mail 1st class for only £1.75. This price includes secure packaging* *I can ship this model to Europe for £3.30 and the rest of the world zone 1 for £3. Peco SL-29 Uncoupler/Decoupler TL Type (Pk2) OO Gauge - Suitable for Hornby Bachmann, Lima Etc. Used model railways & collections always wanted. How it started; I have been interested in model trains since I was a child. PECO-SL14- FINE TRACK FIXING PINS -VERY FINE!"! WE WILL TRY OUR BEST TO CONSOLIDATE YOUR WINNINGS WHERE POSSIBLE AND STATE THIS ON THE INVOICE. WILLS - SSMP212 - Brickwork Plain Bond. WILLS - SSMP225 - Box Profile Cladding. WILLS - SSMP213 - Clapboarding. 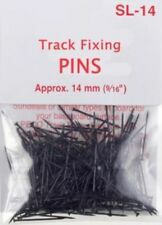 4.5 out of 5 stars - PECO-SL14- FINE TRACK FIXING PINS -VERY FINE!"! 13 product ratings13 product ratings - PECO-SL14- FINE TRACK FIXING PINS -VERY FINE!"! MAINLINE 37064 OO GAUGE GREEN CLASS 42 WARSHIP “HIGHFLIER, very good condition for age, runs well in both directions, coupling hook not present at both ends for aesthetic reasons, both tyres present, directional light not working at one end, box tatty, please look at all the pictures as they form part of the description, UK bidders only please, Condition is Used. Dispatched with Royal Mail 2nd class signed for, thanks for looking. Hornby R8223 Track Extension Pack C Standard Single OO Gauge 1:76 Scale. Condition is New. Length 168mm. 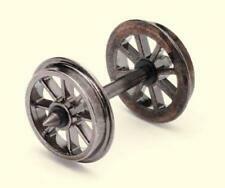 Can be used with competitor train sets and model railway layouts including Peco and Bachmann. Detailed scale model designed for adult collectors and is not intended for play. This product is not suitable for children under 36 months as it may have sharp edges and small parts. LMS 63' Sleeper Car 0.008 Etched Brass Sides & Underframe Underframe Conversion Parts By Ultima Models No UM/E 1008. 'N' Gauge 1:148 Scale This Is A Good Coach Conversion Set. Very Unusual Item, Rarely Seen. It Has Been Stored For Many Years. * I Ship To Any Country World Wide!! * This set of Ultima Models LMS Sleeper Items are in excellent condition as they have been in safe storage for quite a few years. When complete and painted the converted coach will look superb on any period layout - Check the photos. *I will send this model within the UK via Royal Mail 1st class for only £1.75. This price includes secure packaging* *I can ship this model to Europe for £3.30 and the rest of the world zone 1 for £3.95 & zone 2 for £4.10 via Royal Mail Airmail. These prices include secure packaging*. A Superb Example of this Fleischmann (7030) N Gauge Class 91 2-6-0 Tank loco '1001' of the Deutsche Bahn. The Locomotive is in Pristine "As New" Condition and Appears to have been Seldom, if ever, Used. hornby buffers wire track connect points fence trees, grass, stones, foam for track selling as job lot . This uncoupler is designed for use with Hornby style OO couplings. WORKING ORDER: N/A. Get Social. SMART HORNBY R350 OO GAUGE MODEL RAILWAYS - BR GREEN CLASS A4 STREAMLINED PACIFIC LOCOMOTIVE No.60022 MALLARD IN EXCELLENT CONDITION AND MINT RUNNER WITH EXCELLENT BOX. BR 01 STEAM LOCOMOTIVE. STEAM LOCOMOTIVE. DB, BLACK/RED. We will always help you to have a 100% positive happy buying experience. LISTER I.D. PD. A Mint Example of this Graham Farish (372-920) N Gauge Deltic Prototype DP1 Blue & Cream. The locomotive is DCC Ready with a factory fitted 6-Pin Socket. Simple to use, will operate with Peco N gauge ‘Elsie’ (ELC) and most other makes of standard N gauge couplings. Assembly required. Deluxe Materials AD25 Scatter-Grip Tacky Glue. 80 thou (.080") 2.0mm thick clear plastic card. Dummy 3 link coupling fitted at one end, standard Bachmann coupling at the other. 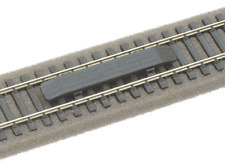 HORNBY R601 365mm DOUBLE STRAIGHT TRACK. NEW.